The Lean Manufacturing world is littered with new terminology, and given the discipline’s origins, it’s not surprising that some of these words and phrases are Japanese. Being “fluent” with these words to the point that you can bring them up in casual conversations with coworkers is half the fun. Even better, these words have the power to transform your organization in a way that often-used acronyms like MRP, ERP and APS do not. Two of the most powerful are: Kaikaku and Kaizen. 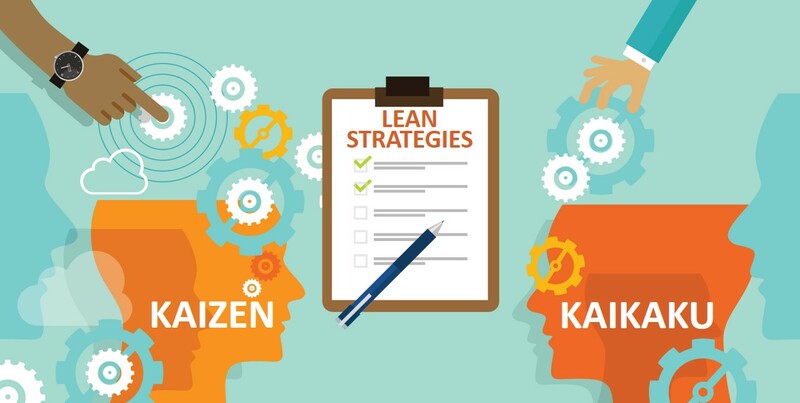 Kaikaku and Kaizen are both ways to approach Lean Manufacturing. While they are both important, they are also fundamentally different. Kaizen seems to be the most often used in Lean discussions, so let’s start there. Kaizen is often described as continuous improvement. There is some convincing evidence that this word has lost some of its original Japanese meaning (and power) when applied in the western way, but it is still highly useful nonetheless. Kaizen is often used to describe the smaller steps taken as part of the overall lean journey. 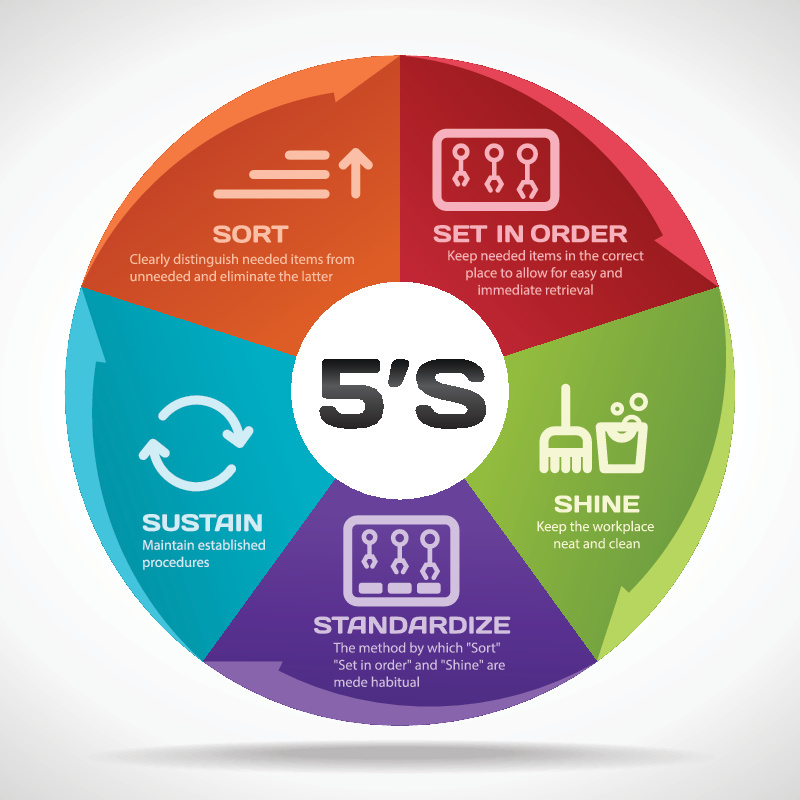 For example, a Kaizen event may be used to implement 5S ­– sort, shine, set in order, standardize and sustain – in a work area. Or if you prefer the Japanese S’s: seiri, seiton, seiso, seiketsu, shitsuke. Again, the translation into the English 5’s isn’t exact, but it still works. While it’s not a literal translation, I like to think of Kaizen as the “zen of change.” You start out with a 5S Kaizen event that creates a cleaner, more organized work center. With everything flowing more smoothly, workers take notice and get behind your efforts. That enthusiasm snowballs, and eventually you have real momentum ­– exactly what you need when you may be asking people to change an approach they have been following for twenty years or more. Kaikaku translates into radical change. 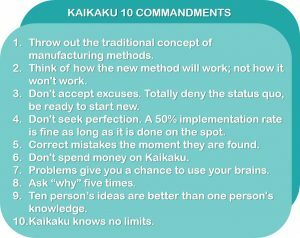 We don’t hear Lean practitioners talk about Kaikaku nearly as much as they talk about Kaizen, perhaps for good reason. The continu ous improvement philosophy underlying a Kaizen event, even a Kaizen blitz, is something people can get behind. You start talking about radical change, and you might encounter some real resistance. Yet, Kaikaku is as vital to Lean as Kaizen. In fact, I would suggest that if you’re not seeing bottom line improvements from your Lean initiatives, it may be because your company leadership hasn’t bought into the concept of Kaikaku. 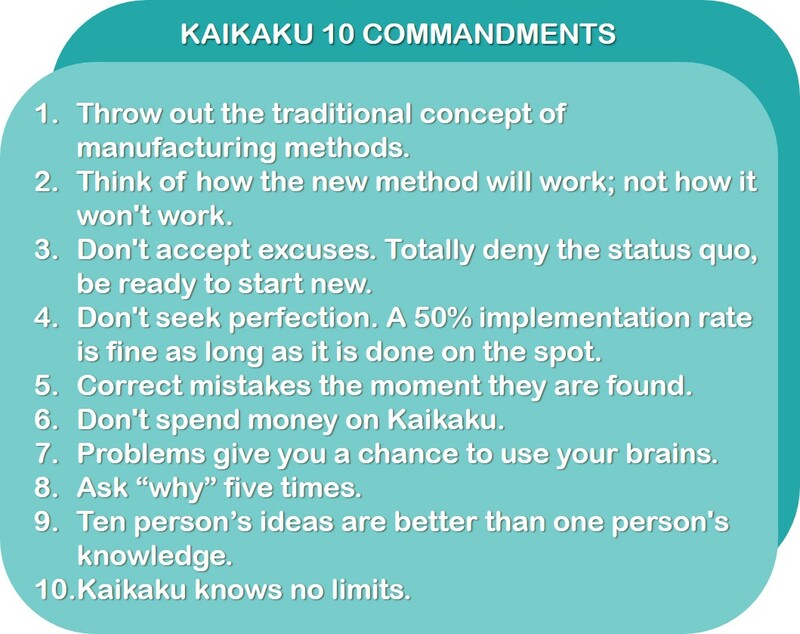 Looking at these commandments, it’s clear that Kaikaku isn’t intended to be seen as an “event” the way Kaizen is. 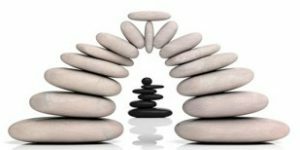 It’s more of a change in the company culture that says, “we’re implementing Lean, and we’re not looking back.” While some of these commandments can be implemented by facilities managers (e.g., #5), several of them need to be implemented at the highest levels in the company. You can’t exactly “totally deny the status quo” or “throw out the traditional concept of manufacturing” unless you have support from the CEO on down. Even accepting ideas from ten people instead of one expert is a cultural shift that needs top-down leadership. Getting the C-Suite to give up its gurus isn’t always easy, but if they’re clinging to the idea that change needs to be led from outside the organization, you’re going to have some problems with this one. 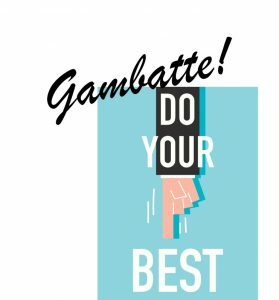 The continuous improvement aspect of Kaizen is all about doing your best. You make a change, learn from it, and use that learning to continue to improve. The concept of doing one’s best is also found in Kaikaku. Commandment #4 specifically states that the goal is not perfection. 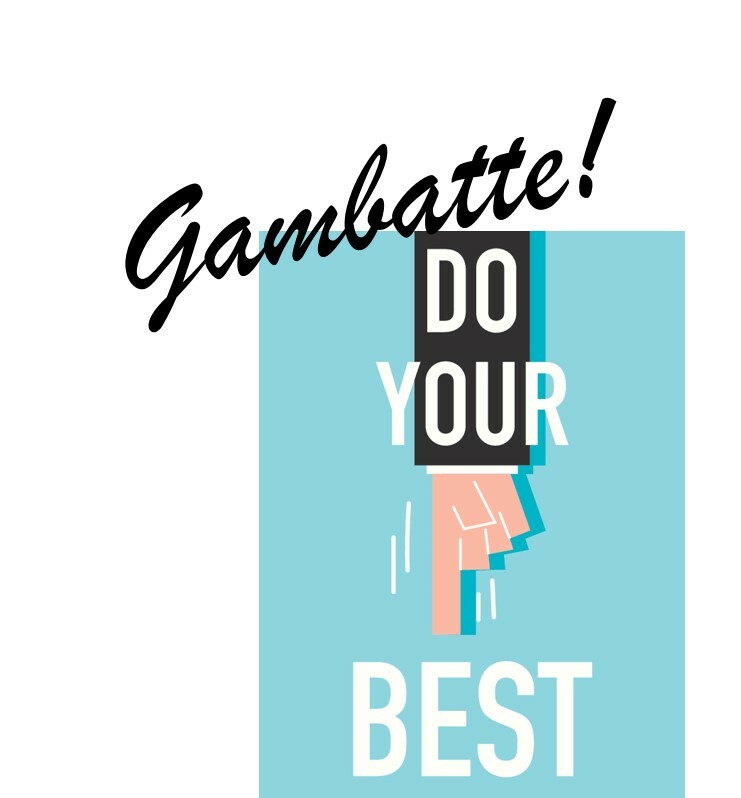 So, as you venture forth on your own Lean journey, “Gambatte!” If you have questions along the way or would like to discuss how our applications can support your efforts, we’re always happy to help. 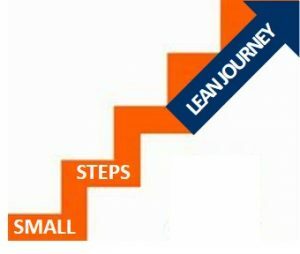 You might also enjoy the recent guest posts from Jim Shore, a principal at Quality Lean Solutions, a consulting firm that specializes in medical device companies, supplier quality and lean manufacturing principles. In these posts, Jim shares his real-world experiences in helping clients implement pull-based replenishment. These posts are all about Kaikaku and Kaizen in action.